I did not just hear that. In my mind, it defied possibility. Without trying, my mind jumped back to prior conversations, emails, text messages, and even her comments on my blog posts. All still so very real. And yet what I experienced in that moment was very surreal. We had just spoken recently—I could still replay the sound of her voice in my mind. I could hear her laugh. I had just sent her a card, making sure she knew how much I loved and appreciated her. Had she received it? I sat, stunned, for what seemed like hours yet at the same time felt like it could’ve only been seconds. Sure enough, it was all over social media. I was grateful God spared me from finding out about it there. My own parents were both deceased, so grief was not foreign to me. And yet it doesn’t change how you feel with subsequent loss. Pain is pain, loss is loss, shock is shock. #Grief was not foreign to me. Yet it doesn’t change how you feel with subsequent loss. She had become like a mother to me, and a spiritual mother for sure. I thought of her in heaven, and knew there was no place she’d rather be. Heaven’s gain was our loss. And what a great loss it is. To never pray with her again…she prayed powerful, equipping, encouraging prayers that left me ready to go back into battle. To never hear her infectious laugh gain…a laugh that brought pure joy to anyone who heard it. To never receive another surprising but encouraging comment on my blogs…it always amazed me when she, my mentor of such, would tell me how much my writing taught her. To never receive another hug from her…the hugs that were so genuine, comforting, and empowering. As I began the grieving process, God used even her death and brought beauty from ashes. Those of us who loved her and grieved her death were given an amazing opportunity to begin to see how many lives she touched having lived out her faith. She did not just hear God’s word, she lived it. Even in her death she inspired each of us who loved her to want to have the same spiritual legacy. 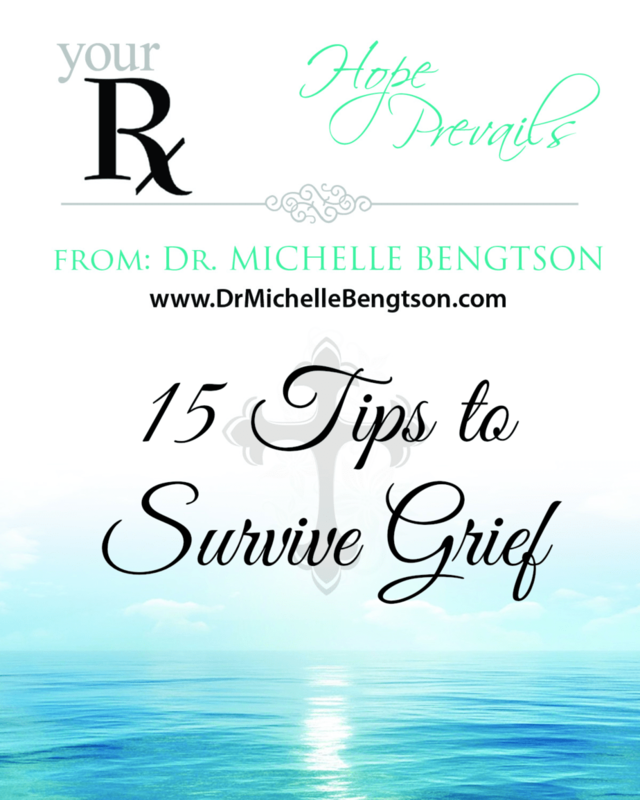 Both because of my professional training, but also through personal experience, I’ve learned many things about grief. 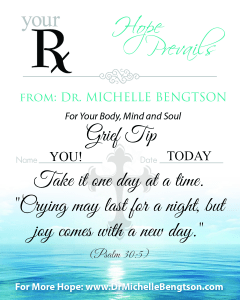 Maybe these grief tips will help you or someone you love. Grief is hard, but remember that our God is faithful. Cling to the One who is well-acquainted with our sorrow. God doesn’t expect us or require us to remain strong. He promises in our weakness, He will be our strength (2 Corinthians 12:10). We never go through grief alone—God promises to catch all our tears (Psalm 56:8). Trying to deny your emotions doesn’t cause them to go away…they’ll resurface later at a less predictable, and often less-controlled way. Allow yourself to feel, and take your feelings to the One who is well-acquainted with our grief. 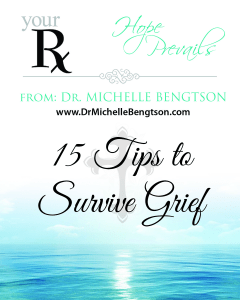 Allow yourself to feel-Take your feelings to the One who is well-acquainted with our #grief. Take it one day at a time. “Crying may last for a night, but joy comes with a new day” (Psalm 30:5). Peace never comes from focusing on our problems. It comes only by focusing on our Heavenly Father, our Problem Solver. Savor the memories as well as the moments of today. We never know how many tomorrows we will have. Grief is personal. Don’t compare your grief to anyone else’s. No two people experience is exactly the same. It’s okay to need and ask for help. It isn’t a sign of weakness, but rather, a sign of courage and strength. Others want to help but don’t know your needs. Help them help you by asking for what you need. The enemy would like to keep us trapped in the memories of the past, but God is in the present. “God is our refuge and strength, an ever-present help in times of trouble” (Psalm 46:1). Platitudes don’t ease pain. Sometimes a hug or a squeeze on the shoulder gives more comfort than words could ever provide. Sometimes we don’t need words, we just need to know others are praying for us to get through the rough moments. “My goal is that their hearts would be encouraged and united together in love, so that they might have all the riches of assurance that come with understanding, so that they might have the knowledge of the plan of God” (Colossians 2:2). Trust God that He will bring good from your pain. He promises to “bestow on them a crown of beauty instead of ashes, the oil of joy instead of mourning, and a garment of praise instead of a spirit of despair” (Isaiah 61:3). Hang on. Cling to God. Your grief will be redeemed. “Very truly I tell you, you will weep and mourn while the world rejoices. You will grieve, but your grief will turn to joy” (John 16:20). Grief is painful. But God has a plan for each of our lives, which is good, and includes hope and a future. “‘For I know the plans I have for you,’ declares the Lord. ‘Plans to prosper you and not to harm you, plans to give you a hope and a future'” Jeremiah 29:11. I’d love to know which tip is your favorite? Or share one of your own. Compassionate outreach for those needing God’s tender care. May your week be blessed. Visiting from Playdates With God. Thank you Lisa. I pray it brings someone just the comfort they need in a time of loss. Because of Him, Hope Prevails! Hey, Doc…,I am so sorry for your loss. Most of the people I loved are dead, and they died violently. I get it. Sorry I’ve been away. Been very ill, and was cut off from most internet access for awhile. You have been in my thoughts. I did not forget you. Andrew, I was SO glad to see your name pop up in the comments! I’ve wondered how you were, where you’ve been, etc. I’m so sorry you were ill, and so sorry you’ve had to deal with grief more than any of us would ever dream. I pray you are on the mend. Susan, thank you for your kind words. Yes, to everything there is a season. A time for joy, a time for grieving. I’m so thankful, however, that we have a Savior who is well-acquainted with our grief. Because of Him, Hope Prevails! Wow, powerful words, full of truth! I don’t know that I could pick a favorite one! 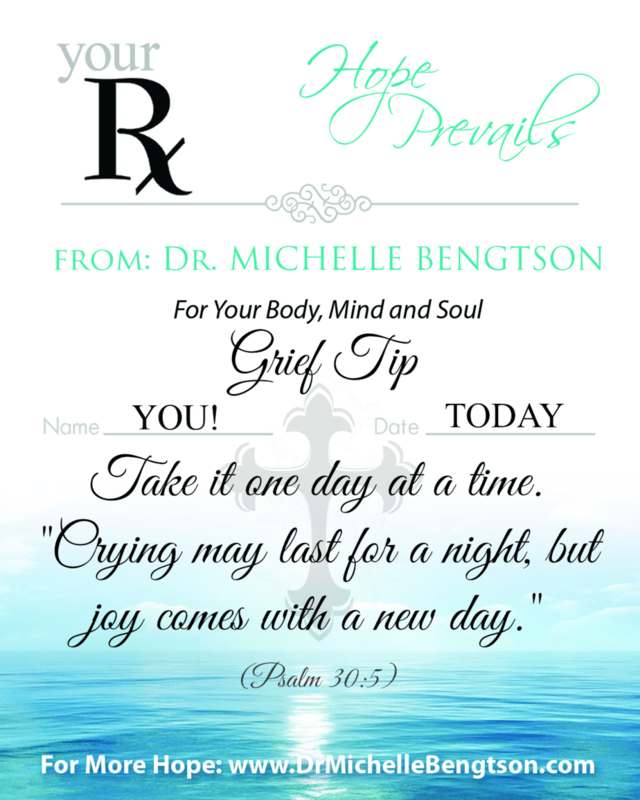 Great reminders that everyone grieves differently, that God is our strength, and that it is healthy to let ourselves feel our emotions fully! You’re so kind Kamea. Thank you for your encouraging words. 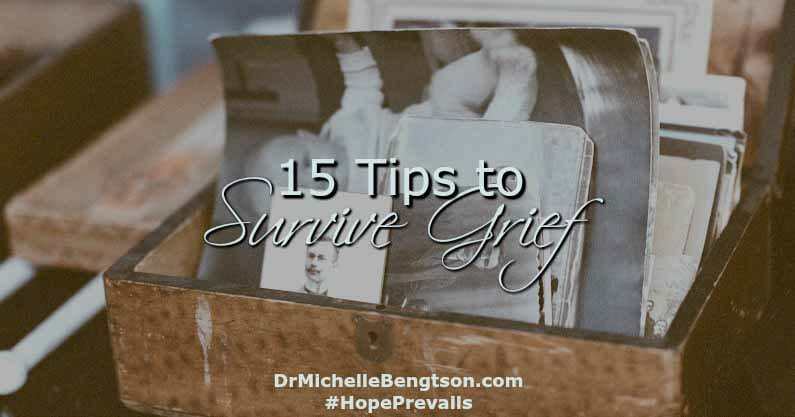 I pray this post provides hope and encouragement to those dealing with grief today. Because of Him, Hope Prevails! All of these are meaningful to me. I recently lost my youngest sister tragically and suddenly. I find that the last one stands out the most. I’m clinging to God with all that I have believing that He will somehow redeem this pain. My prayers for you continue, Michelle. Melinda, I am so very very sorry for your loss. 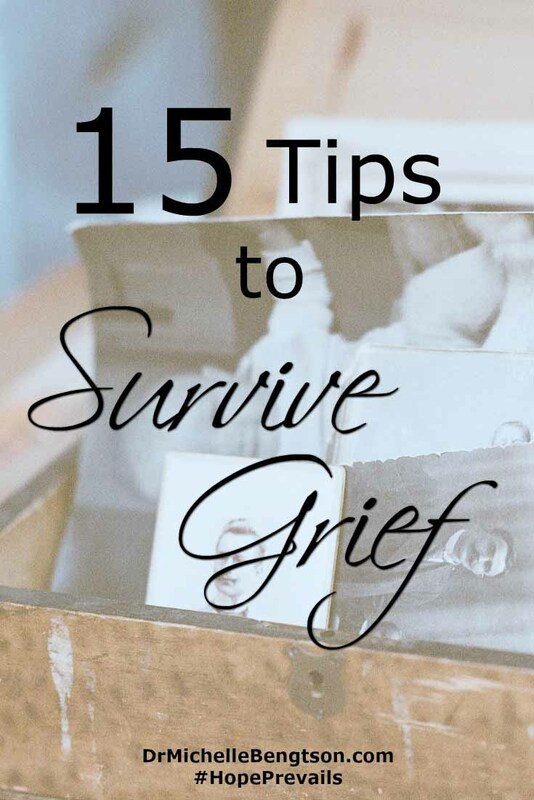 Grief is never easy, but sudden and tragic deaths are so very difficult. It’s in times like this that we must cling to Him above all else. He promises to redeem our pain. Praying you see that soon. Because of Him, Hope Prevails! Oh, #8 & #9 are so important and yet so rarely addressed in the church. Thank you for such a healing post! Thanks Carrie. It is my prayer that it will help many who are hurting. If it isn’t addressed in the church, then we must be the church and address it. Blessings! These are wonderful reminders. Thank you so much for sharing these. I am no stranger to death in my life and find all of these to be definitely true! Thank you! Vanessa, I’m sorry you’ve had to deal with death and loss. At some point, we all will, and we will all be left to manage our grief. I pray these tips will be of help to someone else. Because of Him, Hope Prevails! I’m so sorry for your loss, Michelle. I love #8 and #9. I especially like what you said in response to someone else’s comment about ‘if it isn’t addressed in the church, then we must be the church and address it.” YES! Thank you for sharing your wisdom and truth each week at #InspireMeMonday. Thank you for your kind words Anita. I truly believe that we must be the church and be a hospital for the hurting. I hope these posts help in some small way to show others His help and hope. Thanks for the encouragement! Oh Laura, I still remember the day my mother died like it was yesterday. I’m so very sorry that you are grieving the loss of your mother now. Things are different now, but God remains the same. I hope that you see his faithfulness in a fresh new way. Hugs! Oh my dear Dr. Michelle, I can’t tell you how grateful I am for this timely post. You see, my precious grandpa went home to be with the Lord a couple weeks ago and it was rather unexpected…. I greatly needed this post and the sweet words of encouragement. From the bottom of my heart, thank you for sharing with Roses of Inspiration. Hugs and blessings! Stephanie, I’m so very sorry you lost your grandfather, and unexpectedly at that. I’ve lost people in my life years ago, but the Lord has reminded me afresh about the truth with respect to grieving after losing a good friend just a few weeks ago. Since that happened, not a day goes by that I don’t hear of someone losing a loved one. Death and grief are all around us. I pray this post comforts you, and that you too, will be able to give others the same comfort He has given you. Hugs! Because of Him, Hope Prevails! Thanks for sharing, and for linking up at Christian Fellowship Friday. Very timely, but I expect that was on purpose. 🙂 Be blessed! DaLynn, It has surprised me since I lost my own dear friend, just how many others have lost loved ones. I pray this post brings the same comfort to others that God has provided me. Because of Him, Hope Prevails! I am so sorry for your loss. Thank you for your wisdom in offering this post. I know that it will help many in dealing with their own grief. Thank you for your encouraging words, Barbie. I sensed God urging me to be authentic in my grief, and in doing so, allow Him to bring beauty from ashes. I pray that my story will help comfort others and bring glory to Him. Because of Him, Hope Prevails! Hi Dr. Michelle! Just wanted to pop in and let you know that this lovely post was featured at Roses of Inspiration this week 🙂 Hugs to you! What a sweet blessing, Stephanie! Thank you so much! I pray it encourages others! Because of Him, Hope Prevails! You’re so kind and encouraging Hope! It’s my prayer that my posts do as you have done and encourage others. For Scripture tells us to comfort others with the comfort we have been given. Because of Him, Hope Prevails!